I spoke with E. L. Doctorow in 2000 shortly after the publication of his novel City of God in his home in Sag Harbor, New York about growing up with jazz and how music continues to bring joy and inspiration to his life and work. Doctorow agreed to sit down with me on the condition that I tell him the jazz connection in City of God. While this was an intimidating assignment from this wonderful writer, I plowed ahead and called him with my theory after reading the book. My interpretation, although different than his, was one he liked even better, so he agreed to do the interview. What follows is an excerpt from our conversation that was aired on my Judy Carmichael’s Jazz Inspired radio show. Music has been a part of your life forever, from what you’ve told me. I grew up in a very musical household. My mother was a very fine pianist. As a girl, she paid for her music lessons by playing the piano for silent movies. And her father and brothers would sit in the row behind her and make sure no one bothered her. But she’d look at the screen and she’d rattle off Schubert or Chopin, depending what was going on on the screen…it was totally improvised. She’s really quite good. My father was not a musician, but he was something of a musicologist. He owned a record shop during the ’30s and into the ’40s on Sixth Avenue between 43rd and 44th Street in the old Hippodrome building or theater. In those days it was 78 RPMs. He sold records, sheet music, musical instruments and then radios. Of course, we would wander around that store after it closed on a Saturday evening and toot on the saxophones and bang on the drums. But we were very proud of him because he was so knowledgeable and he had a shop that had stock that no one else in the city had. Not a few of the great artists of the day – Toscanini, Horowitz, Rubenstein – patronized his shop and came in and bought their own records from him. There were always records in the house because music was such a part of the family life. My older brother Don was an aspiring musician. I’ll talk about him too because at the age of 16 he formed a little band. They used to rehearse in the front parlor. They got themselves a job at a Borscht circuit hotel by lying about their age. It’s a great story. His name is Don and his fellow band organizer was named Irwin, so they called themselves Don Irwin and his Musical Cavaliers. There was all this music around. I unfortunately was a very unsuccessful piano student. Usually people were quite relieved when I finished my practice. Was your Mom your piano teacher? No, I studied at a place called the Bronx House, some blocks away on Washington Avenue in the East Bronx. My saintly teacher was a woman named Lisa Elman and she’s the sister of a famous violinist named Mischa Elman. While Mischa Elman went around the world concertizing, poor Lisa had to deal with wretched little miserable students like me. I don’t think it was that bad. Anyway, I gave it up fortunately to everyone’s relief after five or six years. The point about this life was that this was during the Depression. Nobody had any money and my father barely kept the store going. There were always a lot of books in the house. There was always a lot of music in the house. It was what we would call now an enriched childhood. But we didn’t then…nobody called it that then. Because of my father’s knowledge and his love of all kinds of music… My mother was more of a classical person and didn’t really understand jazz or like it. But he loved everything. He would bring home not only great opera performances, but jazz records as well. I remember in particular one album that excited me terribly. It was an album of boogie woogie with people like Jelly Roll Morton, Meade Lux Lewis and Albert Ammons. I remember putting these records on. Already something of an aspiring writer, I would imagine this music as introducing some radio drama that I was about to write, but never got around to writing. In those days, radio always had musical introductions or musical interludes, to allow for transition between scenes. Music was very much a part of the way they did radio drama in those days. Whenever I was excited by music, I always thought of it as the possible beginning of some radio show. I’m fascinated that you didn’t suffer from what so many kids do when their parents love a certain kind of music and they say, “Listen to this,” and the kids will very often say, “I don’t like it all” because of the parents, but it sounds like you were thrilled from the beginning with what your father liked. I was very lucky that way. They were educated and enlightened parents. Then of course there are certain cultural conditions. World War Two stared when I was about ten years old. And my older brother Don went off. He’s about eight years older than I. He either enlisted or was drafted. He went off into the Army. We were all very conscious of the role of musicians in providing morale support for the troops overseas. Stories of orchestras like Glenn Miller’s for instance, going all over. We became aware of the music that was being done for the troops. “In the Mood” was the big hot number. I’m thinking about your book City of God, and having your lyrics from the different tunes throughout the novel, which was a fascinating device for me. The way you juxtaposed it within the story, then interpreted it really made me look at the lyrics differently. I’m glad you mentioned that. I’ll tell you what interested me. I had been listening to jazz for many years. The idea I had was: What if it were possible to do with words what say a jazz quartet does with the music? They state the theme and then each of the members of the quartet goes off and does the variation or the riff. And then they all come back together and play together a little bit and restate the theme. What if I could do that verbally? I would set the lyrics down as the equivalent of the original theme and then do four separate verbal riffs on the original theme. And that turned out to work in terms of this novel I was doing, City of God. And I called these interludes or I gave them the heading of the Midrash Jazz Quartet. Midrash being the collection of interpretations in the Middle Ages provided by the rabbis for the more difficult or cryptic passages in that book of the Bible. In the sense that midrash is an interpretive art, I decided to call these verbal interpretations under the heading of The Midrash Jazz Quartet. I loved it. It made me look at those lyrics as I never had listening to them before. Popular song lyrics are very, very mysterious and often very powerful. They’re quite short. And in that brevity is some compaction in energy in some way. Some of the lyrics are quite mysterious. If you look at the original lyrics of “Me and My Shadow” are very strange – this idea of a doppelganger walking along the street with this shadow in this empty city. It’s quite a set of images. Or a song like “Dancing in the Dark” which is the basis in this book for these musicians to go off on these philosophical bents. It becomes kind of an existential thesis. I have the greatest regard for lyrics of some of these standards. They’re not poetry quite. They’re something else. But it is a great, great art. I learned a little bit about lyric writing as a result of working with the people who put together the musical version of Ragtime. Incidentally, I should say at the outset that for all my love of music – jazz, popular, swing – I came to ragtime rather late. It was actually in the early ’70s. There was a little boom. I remember particularly listening to a very classical interpretation of Scott Joplin rags by a pianist named Joshua Rifkin. That helped me to put that book together. It became a possible metaphor for the entire action of the book. And it meant things to me privately. That book, like all my books, I dig it out of my brain. I just imagine the brain as a rag bin and you pull out these little bits of cloth and sew them together and there’s your book. But people said that the rhythms of the sentences and the flow of language in that book actually attempted to reproduce the rag. I never intended that. I don’t quite believe it, although it’s certainly flattering. What I did do is, I divide that book into four parts, a rag is in four parts. In the way it plays off personal lives against historical forces, you could make the claim, I suppose, that the historical forces are the basic stride or the inevitable irrepressible beat, and the attempt to escape history is the syncopated right hand. What role does music play in your novels? There’s a lot of music in all the books. In Billy Bathgate as Bill Weinberg is being taken by tugboat out to New York harbor with his feet in a bucket of cement, where he’s going to be deposited for whatever sins he’s committed, at least in the mind of Dutch Schultz, as he’s waiting for death, he begins to sing, “Bye Bye Blackbird.” And that was actually picked up for awhile in the move and then it wasn’t used, which astonished me. I thought it would be immensely powerful to see Bruce Willis on this heaving tugboat deck in the black of night, singing “Bye Bye Blackbird.” But it didn’t happen. No, I don’t listen to music when I’m writing. Writing a novel is really an insane … it’s an act of extended concentration. And it’s very wearying. You can’t go at it halfway. I for instance always face a wall when I’m writing. I won’t face a window. I’ll arrange it so that the only way out is through the sentences. That’s the kind of thing you have to do. People think a jazz musician is just out there and it’s like watercolor, it’s very fast. You have your ideas and you have to put them out there, and you have to go with it. But with a novel, you’re constantly polishing, polishing, polishing. Yet I was struck by how you are saying that you need things to keep propelling you forward. That’s the key part of it. You do end up editing yourself. You don’t do that immediately perhaps, but eventually you discover the premises of your book. And you have to deliver on those premises. That’s where the editing comes in. That’s when the polishing comes in. It’s definitely not a performing art. It’s not time driven. Some books take years to do. But there is a sense that I suppose is equivalent to the musician’s improvisation which is that at the beginning of things, you’re writing to find out what you’re writing. And, unless you’re doing that, if you already know what you’re up to or what you’re doing, it’s not going to work So in that sense, while the jazz musician knows certain intervals or things that he can always drop in there, nevertheless there’s a lot of total spontaneity and self-discovery in the performance of it. And that’s what is so exciting. In a great novel, you have to be open to where it’s taking you to. I was trying years ago to explain the process. I came up with an image that people seemed to like. Writing a novel is like driving a car at night. You can only see as far as your headlights extend, but you can make the whole trip that way. 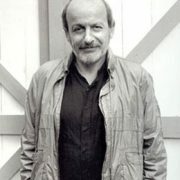 To listen to the entire conversation with E.L. Doctorow, along with the music that influenced him, or to hear interviews with other notable people inspired by jazz, go to Judy Carmichael’s Jazz Inspired web site.